Mangos originated in northeast India, north western Myanmar and Bangladesh. Buddhist monks took mango plants on voyages to Malaya and eastern Asia in the 4th and 5th centuries BC. By the tenth century AD, Persian traders had taken mango to the Middle East and East Africa. Mangos are now cultivated commercially throughout the tropic and subtropical areas. Generally, Mangoes are extremely juicy and have a high water content, making them refreshing but, somewhat, messy to eat! In addition to sumptuous tropical flavour, mangos deliver a host of nutrients and make healthy eating a delightful sensory experience. Mangos are an excellent source of vitamins C and A, both important antioxidant nutrients. Vitamin C promotes healthy immune function and collagen formation. Vitamin A is important for vision and bone growth. Mangos are also a good source of dietary fibre. Diets low in fat and high in fiber-containing grain products, fruits, and vegetables are associated with a reduced risk of some types of cancer. The pineapple is native to southern Brazil and Paraguay. The natives spread the pineapple throughout South America and it eventually reached the Caribbean. Columbus discovered it in the Indies and brought it back with him to Europe in 1493. Columbus thought the fruit looked like a pine cone, so they dubbed it the "Pine of the Indies." When they introduced it to the English later on, they added the word "apple" because they thought it should be associated with another delicious fruit that people enjoyed! 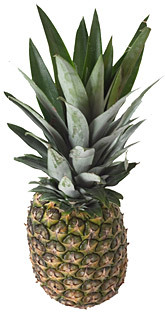 Pineapples contain Vitamins A and C, but most importantly, they are a great source of an enzyme called Bromelain. Bromelain helps the body's digestive system and it also has anti-inflammatory properties as well.